Two copywriter brothers and their apprentice compete in a music contest. 'Shortcut Safari' is about adventures of a group of 7 urban children, between ages 10 to 14 years, who get stuck in a deep, dense forest while returning from a day long trip organised by the Nature Club of their School. An alcoholic, cancer-ridden American film-maker decides to produce a Bollywood movie. While Jonaki, an 80-year-old woman, searches for love in a strange world of decaying memories, her lover, now old and grey, returns to a world she is leaving behind. Such a waste of talent..disappointing. This is mainly about a 32 years old virgin, who is desperate to prove his "manhood" (yes that's what they keep saying again and again in the movie). The humor is cheesy. How can this movie be called comedy? This movie has no taste at all. Its over dragged. 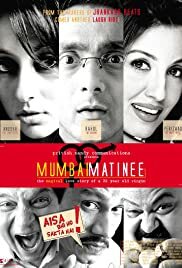 After watching this movie I started to wonder why would seasoned actors like Rahul Bose, Perizaad Zorabian, Vijay Raaz and Saurabh Shukla act in a movie which has such a weak script. Can't believe this movie came from the director of Jogger's Park. Direction is not bad. I would not suggest this movie to anyone. There are a very very few funny moments in the movie, you can actually count them on your fingers. Disappointed.